We should perhaps start off by pointing out that hiking shirts aren’t necessarily different than your everyday shirts, not by a long shot. Where these shirts differ is in the stitching and fabric bonding department, because a hiking shirt has to be sturdier overall. To some extent, most hiking shirts enjoy similar characteristics like flat sewn seams, polyester-based fabrics, and layered designs. So this is more or less what you need to look for when you’re buying a hiking shirt. 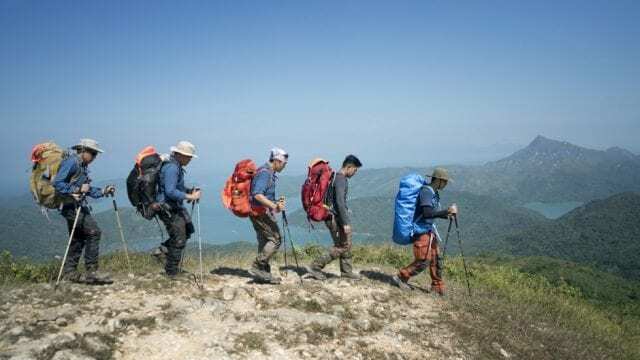 After taking everything the market has to offer into consideration, we put together a list of the ten best hiking shirts out there for you to look at, a list of shirts that stand out for their flexible yet sturdy construction and reasonable comfort levels. 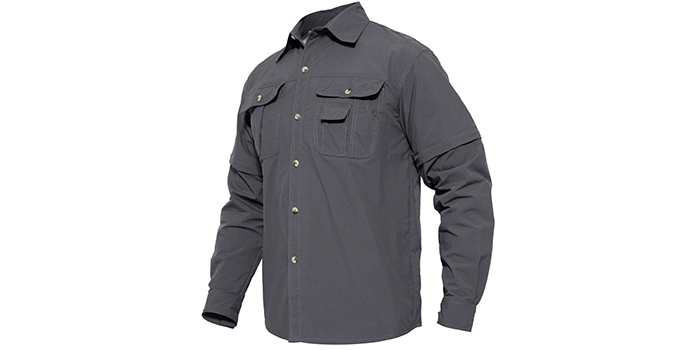 Light in weight, ultra-breathable, and quick-drying, the Magcomsen Men’s Long Sleeve Rip-Stop Shirt offers optimum comfort and ease of movement. 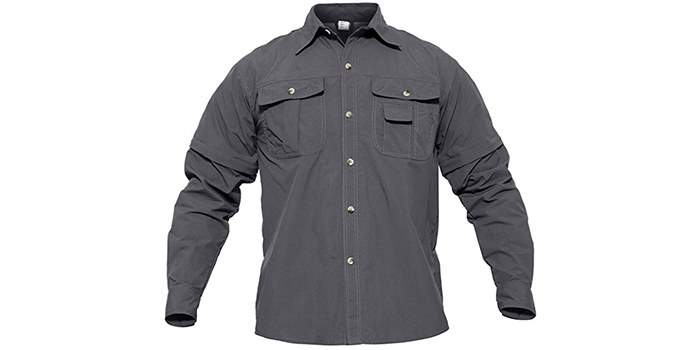 Made from rip-stop, heavy-duty polyester, nylon and cotton, this shirt is great for warm and cold weather. Thanks to its versatile design, the sleeves can be zipped off, converted into a short sleeve shirt and rolled up and secured with durable button tabs designed on each sleeve. Featuring patch pockets on the chest and a button-down front design, it comes equipped with a vented mesh-lining on the back and the shoulder area for optimum airflow. 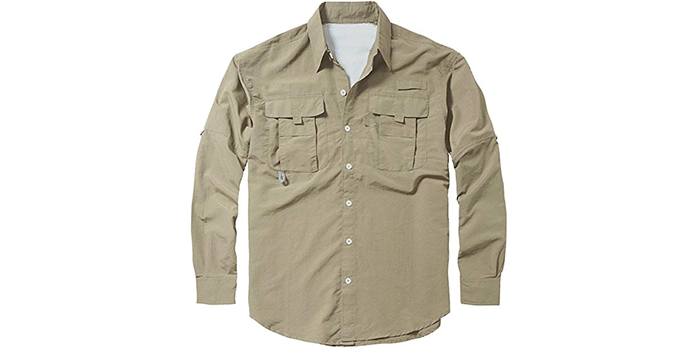 The Coofandy Men’s Performance Quick Dry Outdoor Shirt is a premium hiking shirt crafted with 98% cotton and 2% polyester material. Durable and multi-functional, it is designed to provide cool comfort and features an ultra-light ripstop fabric that is resistant to moisture and provides UPF 40 sun protection. Great for traveling, it comes with multiple pockets that allow you to store your important items. Ideal for casual outings, hiking, fishing, camping, and other outdoor activities, it can be teamed up with a pair of jeans or casual pants for a stylish modern look. Made from 100% premium quality nylon, this hiking shirt from Crysully is uniquely designed with detachable sleeves that can be unzipped and converted into a short sleeve shirt. Thanks to its special fabric, it can dry 50% faster than other shirts of its kind. Crafted specifically for hiking, camping, running, traveling and other outdoor activities, this shirt offers optimum breathability and durability and is great for wearing in hot weather conditions. Available in 5 vibrant colors including black, army green, gray, khaki and blue, it is designed with a regular fit. A popular hiking shirt designed especially for women, the Little Donkey Andy Women’s Stretch Long Sleeve Shirt is crafted from 90% polyester and 10% spandex, and also stretches 4 ways and provides a smart comfortable fit. Quick-drying, light in weight and extremely durable, it also comes equipped with UPF50+ blended in its fabric to help protect you from the harmful UV rays of the sun. Thanks to its unique design, it comes with long sleeves that can be rolled up and converted into a short sleeve shirt with the help of a convenient loop and button. Including 2 pockets on the front, it comes equipped with 2 additional pockets on the sides with zips and a hallowed back with vents for optimum airflow. 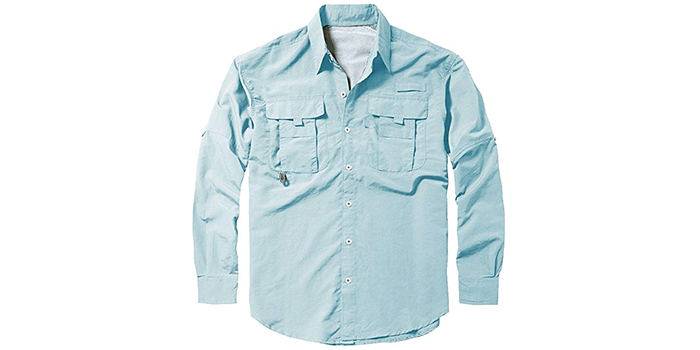 Designed for hiking, fishing, camping, and other outdoor activities, the Toomett Men’s Sweat Fishing Long Sleeve Shirt features 100% high-quality nylon fabric that is quick-drying and ultra-breathable. Equipped with strong button tabs on the outer area of each sleeve, it helps provide a secure hold when rolled up. Thanks to its specially designed vented back it offers optimum breathability and is moisture wicking. 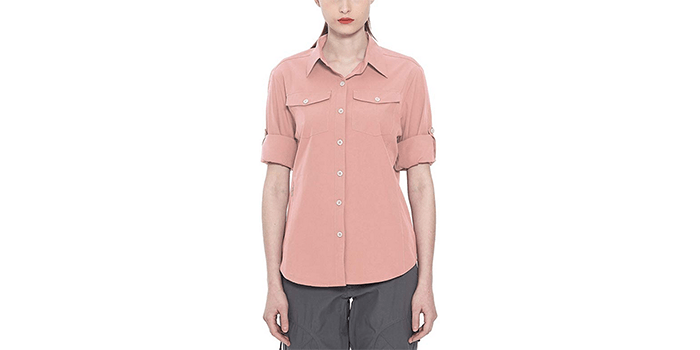 Available in a variety of colors, this shirt is not only protective but stylish and trendy. 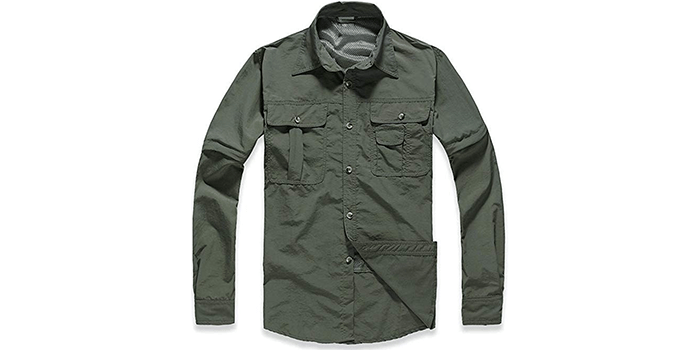 Available in a variety of colors including black, khaki, gray, blue, and green, this stylish solid long sleeve shirt from Tacvasen is the ideal clothing for hiking, camping, army training, hunting, climbing, fishing, and more. Featuring convertible sleeves with zippers, it offers optimum breathability and is quick drying. Resistant to scratches and abrasion, it also comes with the latest UV protection that keeps your skin safeguarded from skin burns and allergies. Crafted with 2 chest pockets, it features a mesh design at the back that provides enhanced airflow and helps to keep your body cool during warm weather. Put together with 100% quick-drying nylon fabric, the Jessie Kidden Men’s Shirt features UPF50 which helps to block the harmful UVA rays of the sun, preventing skin damage and sunburn. Thanks to its unique design, it comes with buttons on the sleeves that allow easy conversion from a long sleeve to a short sleeve shirt for hotter days. Featuring hidden vents located at the back and on the shoulders, it provides optimum comfort and breathability. 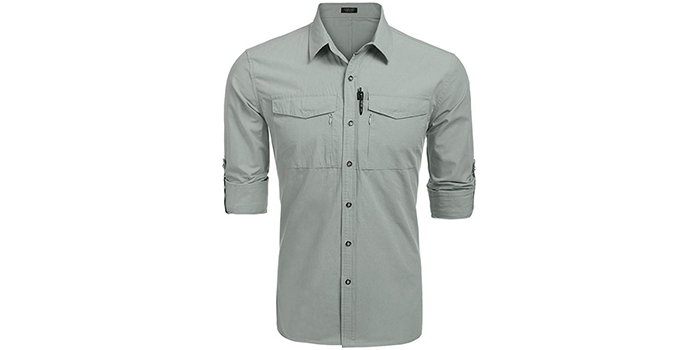 Light in weight, durable, and stylish, this shirt is ideal for climbing, hiking, fishing, and mountaineering and is great for summer, spring, and autumn weather. 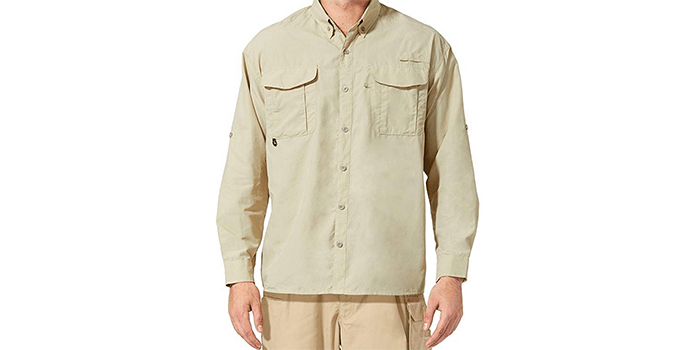 Designed with a nylon outer shell, the Baleaf Men’s Outdoor UPF 50+ Sun Protection Shirt comes with a 100% high-quality polyester inner meshed lining that is quick drying and moisture resistant. Equipped with a button-fly closure, this shirt is light in weight and provides exceptional protection against the harmful UV rays of the sun. Featuring hidden mesh vents on the back, it helps with keeping you cool and comfortable during hot weather. Available in a range of subtle colors, this shirt comes with 2 hook and loop pockets on the chest, 1-rod holder, 1 utility loop and 1 loop for hanging your sunglasses. 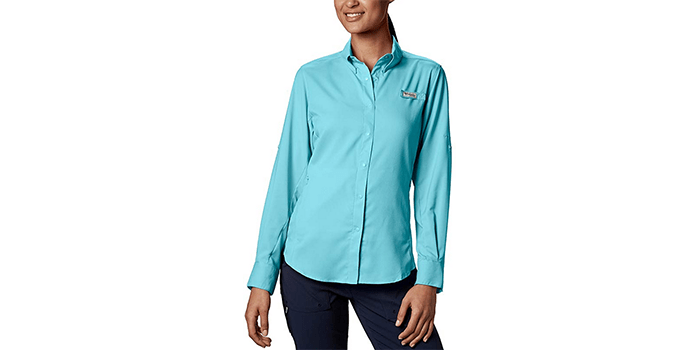 Featuring premium quality Omni-Shade UPF 40 fabric, the Columbia Women’s PFG Tamiami II Long Sleeve Shirt comes with the latest technology that keeps your skin safeguarded from the harmful UVA rays of the sun. Aiming at keeping you cool, moisture free and comfortable, it comes with a mesh inner lining made with polyester. Convenient by all accounts, it also comes with 2 pockets on the chest that allow you to carry handy items while on the go. With a mesh vented back area, this lightweight, durable shirt provides optimum breathability while ensuring you stay cool and relaxed even during hot weather conditions. 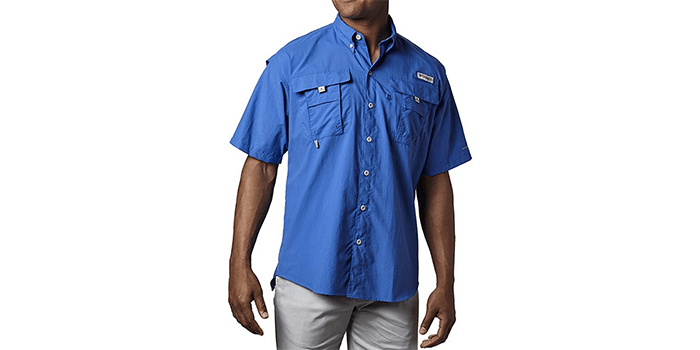 Available in a wide range of exciting colors, the Columbia Men’s PFG Bahama II Short Sleeve Shirt is a 100% Tactel nylon product that offers a relaxed, comfortable fit. Featuring the latest Omni-Shade UPF 30 fabric, it helps to prevent harmful UVA rays from damaging your skin. Equipped with 2 convenient pockets on the chest with Velcro, it allows easy storage of small items. Crafted with hidden vents on the shoulders, this shirt not only provides optimum breathability but is also light in weight and extremely comfortable to wear during hot weather.